At MI Disaster Team we provide disaster restoration services specializing in storm damage, mold, fire damage cleanup, and water damage. We have been providing 24/7 disaster restoration services that you can depend on for over 40 years. When disaster strikes your home or business, contact the MI Disaster Team for professional disaster restoration services in Commerce Township, Novi, West Bloomfield, Ann Arbor, and surrounding areas. We know that when you are faced with the aftermath of flooding or fire damage, that it not only impacts the structure but the overall impact on your life. 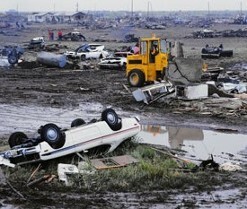 This is why many people call us when they need fast and dependable disaster restoration service in Southeast Michigan. Take fast, appropriate action when water threatens your home. Swift water mitigation reduces or prevents the damage that occurs after a flood or leak and can prevent mold from forming in your home or business. The moment we arrive, we inspect your property for the extent of the damage and then begin the cleanup and drying process. Our water damage service includes top-notch equipment with Phoenix dehumidifiers, HEPA air scrubbers, air movers, and rotary hard surface floor cleaners. We also hook up a Titan 4000 hydroxyl generator to kill odors and bacteria in the air. After a fire, restoration and damage cleanup begins with securing your property. It's important to have trained technicians on site from the very beginning to address damage and minimize future loss. Our fire damage restoration experts take the proper steps to deal with the after-effects and smoke cleanup. High winds and hail can occur during a storm and can cause destruction that requires immediate attention. We know exactly how to spot damaged areas as well as how to provide expert storm damage cleanup. Our team cuts up and removes fallen trees, replaces shingles and siding, boards up windows, and adds a tarp to your roof. Mold can affect your health, so it's important to take swift action in getting mold remediation services. At MI Disaster Team, we are certified in mold removal, decontamination, and disposal. We get rid of any mold growth in your home as well as provide bacteria testing. Our technicians set up HEPA air scrubbers and tape off your ductwork to make sure no contaminants stay in the air. Contact MI Disaster Team when you need professional disaster restoration services in Commerce Township, Ann Arbor, Novi, and surrounding areas of Southeast Michigan.